There is no reason to live with ill fitting dentures that require messy adhesives and limit the ability to chew. 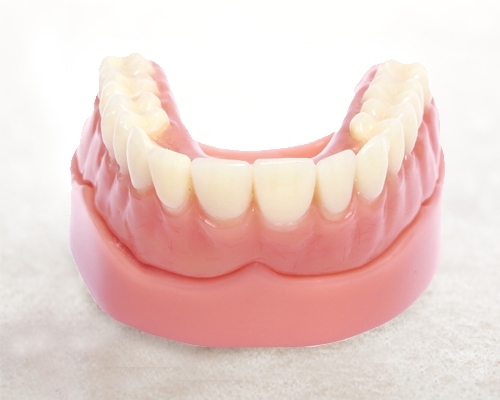 A removable acrylic overdenture is THE BEST and most economical ALTERNATIVE TO A FULL DENTURE. It involves placement of between 2 – 6 dental implants, also determined by bone volume and quality. A temporary denture is fabricated prior to removal of any remaining teeth. Removal of the teeth, placement of the implants, and placement of the temporary denture is usually done at the same visit. Patients will also require 1 – 2 days to recover and will be able to return to work the next day. The patient returns to the office 1 week after the implants are placed to make sure there are no complications and adjust the over denture. After 3 months, the patient returns to have the overdenture relined (refit).